My baby beardie won't eat anything... • Bearded Dragon . org . Be sure the crickets are small and, feed only a few at a time, to many can be overwhelming. He is experiencing what is called relocation stress this takes time to get over. The best way to do this is to let him have his space and, let him get used to you from a distance for a bit. Let him get familiar with his new surroundings slowly, do not try to handle him right away unless he will come to you, DO NOT CHASE HIM. Babies usually don't consider greens as food nor are they required, he needs bugs for the protein to help him grow. You can put greens in the Viv every day to let him find out they are food but, that is up to him.. I agree just give it some time. If your husbandry is in order then your little guy will come around. I'm on my 2nd week with Tombo and yesterday was the first day where I felt like his appetite was fully back. It had been improving after the first week but not till today and yesterday has he had the normal growing baby appetite. It just takes time sometimes, don't get discouraged. I have two new hatchlings in the house too. 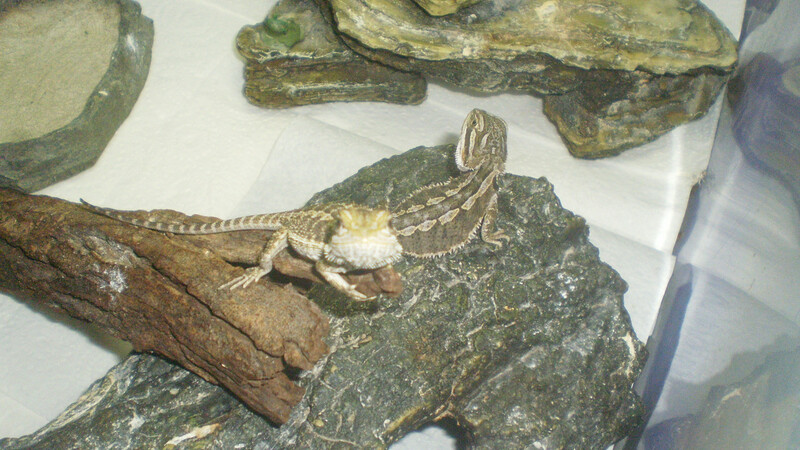 I knew what to expect as I've raised 2 other pairs of hatchling bearded dragons in the past. My two are only 10g and 15g , so only at most 2 months old , the breeder suggested housing together and playing it by ear for now . I was ready to separate the pair from the getgo in two 120L rearing tubs. So they are housed together in a 120L converted tub temporarily , I expect to separate the pair in a month or two. 35W Neodymium Daylight Lamp (gives 38 - 40 degC at highest basking spot , using because I have some in my stash , they are very compact (space is an issue under the lid) and they give the right basking spot temperature for my setup). 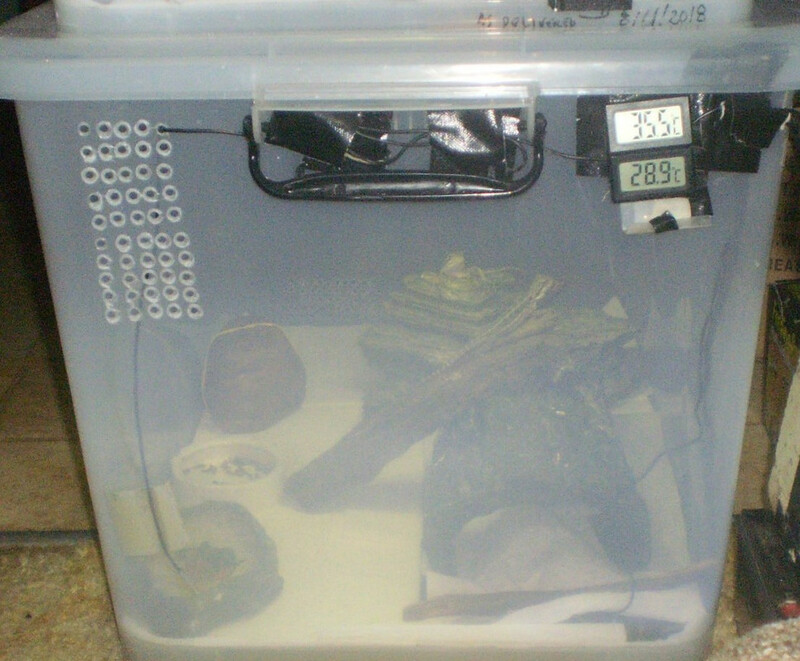 7W heatslab sandwiched between tiles controlled by a thermostat set to hold 35 degC under hide. > I left 40 bsfl in an excape proof porcelain feeding dish over night. > I count the bsfl when I am ready to give them a feed of crickets (about lunchtime) , only a few crickets released at a time. > I remove the salad left when I go to bed , but if I think there may be a rogue cricket or two or three in the tank it's left there overnight ( I'd rather the crickets eat the left over salad than bite my babies). From tonight (this is night #3) I'm removing the bsfl overnight and only leaving the salad. I'm expecting they will be eating 8 - 10 small (1/4 size) crickets per day each (or the equivalent) + a nibble on the salad each day , likely by next weekend. My two had 4 small crickets (25 d/old = 1/4 size) each + 4 bsfl (not sure who ate them) this morning & and there was evidence the salad had been raided too.